Background And Aim: Screening for tuberculosis (TB) is a key strategy for controlling infection. This study aimed to detect latent TB among dialysis patients. Methods: This is a prospective study conducted in King Saud University, Riyadh involving hemodialysis (HD) and peritoneal dialysis (PD) patients aged ≥18 years. Patients were screened for latent TB infection (LTBI) using both TBskin test (TST) and QuantiFERONTB Gold In-Tube test (QFT-GIT). All participants were followed-up clinically and radiologically every 3 months for 2 years. Results: A total of 243 (181 HD and 62 PD) patients were included and 112(46.1%) were males. 45.3% showed positive QFT in HD patients with sensitivity of 91.7%, specificity of 71.4%, positive predictive value (PPV) of 19.5%, and negative predictive value (NPV) of 91.1%. TST results in HD showed that positive TST was 17.4%, sensitivity was 63.2%, specificity was 95.5%, PPV was 51.5%, and NPV was 91.1%. Five (8.1%) showed positive QFT in PD patients with sensitivity of 7.7%, specificity of 91.8%, PPV of 6.6%, and NPV of 92.3%. TST results in PD showed that positive TST was 9.8%, sensitivity was 35.7%, specificity was 97.9%, PPV was 55.8%, and NPV was 93.3%. Previous TB infection was significantly correlated with QFT only in HD patients, but significantly associated with TST in both HD and PD patients. Also in HD, QFT was significantly associated with TST (P = 0.043). Conclusions: Due to high variability of QFT-GIT sensitivity, we recommend its use for its NPV and to use either TST or QFT in screening latent TB. Tuberculosis (TB) is caused by the bacillus Mycobacterium tuberculosis. The majority of patients infected with TB will not develop an active disease, but as latent TB infection (LTBI). ,, Screening and targeted testing for TB is a key strategy for controlling and preventing the infection. We aim to determine LTBI in both HD and PD patients and to evaluate the sensitivity, specificity, and predictive values of both interferon-gamma release assay (IGRA) and TST to improve the standard of patient care. This is a prospective three-center study conducted in King Khalid University Hospital, Security Forces Hospital and Lehbi Medical Center, all located in Riyadh, Saudi Arabia which involves HD and PD patients. The study was conducted from 5 January 2011 to 31 March 2013 and was supported by King Abdulaziz City of Science and Technology grant with reference no. ARP-245-29. Adult Saudi HD and PD patients aged ≥18 years were invited to participate in the study and written informed consent was taken. Patients with major current disease including heart failure or debilitating illness, non-consenting patients, and pregnant women were excluded from the study. Patients were screened for latent and active TB infection using both TST and QFT test. All patients were further investigated clinically and radiologically for TB and followed-up every 3 months for 2 years. All patients underwent Mantoux TST through intradermal injection with 5 tuberculin units of purified protein derivative (PPD). Complete blood count (CBC), differential count, were regularly performed on patient for 3 months. The criteria for determining false positive results in QFT are no previous and present TB, no contact with TB patients, negative TST, and normal chest examination. Whereas, the criteria for determining false negative results in QFT are previous and present TB, contact with TB patients, TST positive, and abnormal chest examination. IBM Statistical Package for Social Sciences (SPSS) for Windows, version 19, 2010, SPSS Inc., was used for statistical analysis. Continuous variables were expressed as mean (standard deviation (SD)). Chi-square test was used for comparing categorical data. Risk was estimated using odds ratio (OR). Nonparametric Mann-Whitney U test was used. For bivariate analysis, Pearson's correlation analysis and Spearman's rank order correlation was used. A P-value <0.05 was considered significant. Data was completed for 181 patients and TST results were available for 172 (95%) participants. 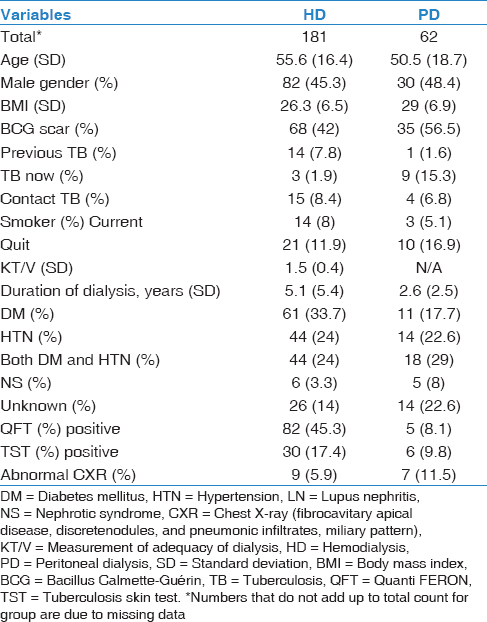 Cause of end-stage renal failure and demographic characteristics of patients are shown in [Table 1]. The main findings of our study are that the QFT-GIT was positive in 82 (45.3%) participants and positive TST was found in 17.4% of our patient. The prevalence of latent TB after excluding previous patients is 42.5% in TB and 14.3% in TST. QFT-GIT was significantly associated with TST (P = 0.043, k = 0.119). The HD group risk factors cross tabulation with QFT and TST are shown in [Table 2]. Previous TB infection was significantly associated with positive QFT results (P = 0.009). ESR was correlated with positive QFT results (rs =−0.156, P = 0.037) however, this relationship became non-significant after controlling for confounding factors (rs = −0.104, P = 0.198). Patient with palpable lymph nodes (rs = 0.21, P = 0.012) and splenomegaly (rs = 0.18, P = 0.032) were associated with positive QFT results; however, only presence of lymph nodes and not splenomegaly remained statistically significant after controlling for confounding factors (rs = 0.184, P = 0.041 and rs = 0.151, P = 0.096, respectively). Patients with cough (rs =−0.17, P = 0.023) and those with productive cough (rs =−0.16, P = 0.034) were less likely to have negative QFT results, which remained significant after controlling for confounding factors (rs = 0.226, P = 0.005 and rs = 0.214, P = 0.008, respectively). Patients who reported not being smokers were significantly associated positive QFT results (P = 0.016); however, this was not significant after controlling for confounding factors (rs = 0.155, P = 0.057). Positive TST was significantly associated with male gender even after controlling for confounding factors (rs = 0.22, P = 0.007) and significantly associated with previous TB infection (rs = 0.212, P = 0.009). Abnormal chest examination was associated with positive TST even after controlling for confounding factors (rs = 0.24, P = 0.008). Nonsmokers were associated with positive TST (rs = 0.198, P = 0.01); however, this relationship was not significant after controlling for confounding factors (rs = 0.17, P = 0.002). Data was completed for 62 participants and TST results were available for 61(98.4%) participants. Positive QFT was found in five (8.1%) patients and positive TST in six (9.8%) patients. The cause of end-stage renal failure and demographic characteristics of PD patients are shown in [Table 1]. Bacillus Calmette-Guérin (BCG) vaccination was reported as 25 (41.7%), while the BCG scar was found in 35 (56.5%). The prevalence of latent TB after excluding previous patients with TB is 8.3% in QFT as well as in TST. There was no significant correlation and poor agreement between QFT and TST in this group (P = 0.415, k = 0.101). 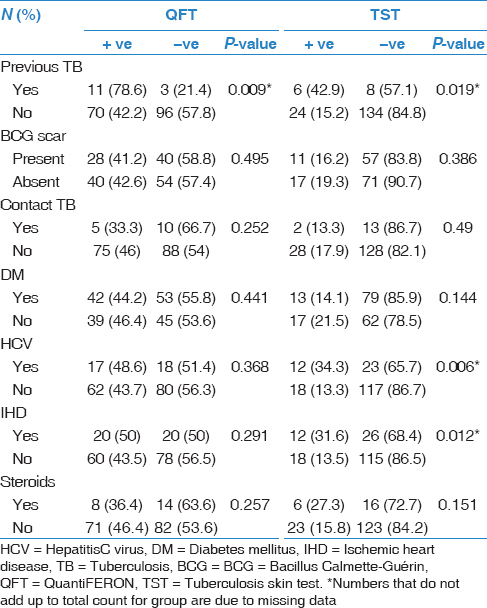 The only one participant with previous history of TB infection had a negative QFT, but resulted to be positive in TST. Patients with splenomegaly from evaluation were significantly associated with positive QFT results (rs = 0.481, P = 0.001). Previous TB infection and contact with TB person was associated with positive TST results (r = 0.391, P = 0.002 andr = 0.357, P = 0.005, respectively), even after controlling for confounding factors. 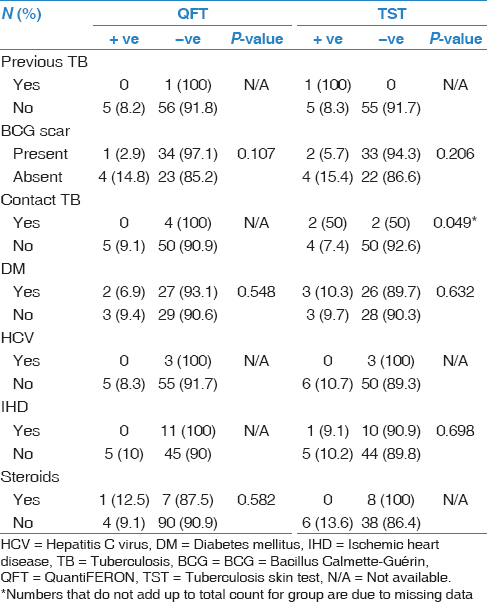 Participants with hepatitis C virus (HCV) had a negative QFT and negative TST results none was reported of having previous TB infection [Table 3]. The results of sensitivity and specificity testing for QFT and TST as well as the PPV and NPV are defined in [Table 4]. The sensitivity and specificity of QFT in the HD group were 71 and 92%, respectively. This is comparable with other studies where specificity and sensitivity among this group was found to be 67.5 and 66.7% in Saudi Arabia,  89.7 and 100% in Turkey,  62.1 and 100% in Taiwan,  respectively; and a sensitivity of 61% in USA by Redelman-Sidi and Sepkowitz. This shows a wide range of variability among other studies, which may be attributed to local prevalence of TB, BCG vaccination status, sample size, and recruitment criteria. Several systemic reviews and meta-analyses have been conducted, looking at the sensitivity and specificity of QFT in correlation with TST as well as its cost-effectiveness. Several studies was reported of having inability to accurately estimate these variables because of the limited number of studies; heterogeneity of patient populations; lack of clear recruitment; diagnostic and interpretation criteria; and diversity of objectives, measurements, and diagnostic tests applied and compared. So interpretation of these results remains extremely variable among authors. A 2010 meta-analysis  concluded that "IGRAs are superior, in comparison with the TST, for detecting confirmed active TB disease, especially when performed in developed countries." While another meta-analysis published in 2011  concluded that in low- and middle-income countries, neither TST nor IGRAs have value for active TB diagnosis in adults. This variability may be explained from an obvious difference between the meta-analyses based from the developed countries, while the other is considering the developing countries. Most studies are favorable of QFT use for its negative predictive values (NPVs),  which supports our findings (PPVfor QFT in HD patients was 19.5 and 6.6% in PD and NPV for QFT in HD was 91.1% and 92.3% in PD). This result conforms to the Centers for Disease Control and Prevention (CDC) released guidelines for the use IGRAs in screening for TB (CDC, 2010),  which states that "IGRAs generally should not be used for testing persons who have a low risk for both infection and progression. "This was in conformation with two other studies by Inoue et al.,  showing PPV of 44.4% (8 of 18) and NPV of 100% (87 of 87) and Găvriluţ et al.,  indicating a PPV of 29.4% and NPV of 96.1%. The strong point of our study is the comparison between QFT test and long follow-up of these patients for 2years. The limitation of our study is that there is no true gold standard for LTBI for the comparison of the results and can be determined only after a long follow-up. With a wide variability in the positivity of QFT sensitivity in both HD and PD patients, it should not be used as the sole determinant of TB status, since the sensitivity and specificity did not reach 99%. We recommend using either TST or QFT as they have the same significance in diagnosing latent TB. We also recommend the use of IGRA for its NPV in diseased patients in conjunction with post-positive TST. We would like to acknowledge and extend our appreciation to King Abdulaziz City of Science and Technology for the support and grant given to us for the completion of this study. Rook GA, Dheda K, Zumla A. Immune responses to tuberculosis in developing countries: Implications for new vaccines. Nat Rev Immunol 2005;5:661-7. Lienhardt C. From exposure to disease: The role of environmental factors in susceptibility to and development of tuberculosis. Epidemiol Rev 2001;23:288-301. Meya DB, McAdam KP. The TB pandemic: An old problem seeking new solutions. J Intern Med 2007;261:309-29.
al-Kassimi FA, Abdullah AK, al-Hajjaj MS, al-Orainey IO, Bamgboye EA, Chowdhury MN. Nationwide community survey of tuberculosis epidemiology in Saudi Arabia. Tuber Lung Dis 1993;74:254-60. Al-Hajoj SA. Tuberculosis in Saudi Arabia: Can we change the way we deal with the disease? J Infect Public Health 2010;3:17-24. Cengiz K. Increased incidence of tuberculosis in patients undergoing hemodialysis. Nephron 1996;73:421-4. Mitwalli A. Tuberculosis in patients on maintenance dialysis. Am J Kidney Dis 1991;18:579-82. Malik GH, Al-Mohaya SA, Al-Harbi AS, Kechrid M, Azhari O, Shetia S, et al. Spectrum of tuberculosis in dialysis patients in Saudi Arabia. Saudi J Kidney Dis Transpl 2003;14:145-52. SCOT Data. Dialysis in the Kingdom of Saudi Arabia. Saudi J Kidney Dis Transpl 2012;23:881-9. Pai M, Riley LW, Colford JM. Interferon-gamma assays in the immunodiagnosis of tuberculosis: A systematic review. Lancet Infect Dis 2004;4:761-76. Mazurek GH, Jereb J, Vernon A, LoBue P, Goldberg S, Castro K, et al. Updated guidelines for using interferon gamma release assays to detect mycobacterium tuberculosis infection - United States, 2010. MMWR Recomm Rep 2010;59:1-25. Altman DG, Bland JM. Statistics notes: Diagnostic tests 2: Predictive values. BMJ 1994;309:102. Al Jahdali H, Ahmed AE, Balkhy HH, Baharoon S, Al Hejaili FF, Hajeer A, et al. Comparison of the tuberculin skin test and Quanti-FERON-TB Gold In-Tube (QFT-G) test for the diagnosis of latent tuberculosis infection in dialysis patients. J Infect Public Health 2013;6:166-72. Anibarro L, Trigo M, Feijoó D, Rios M, Palomares L, Pena A, et al. Value of the tuberculin skin testing and of an interferon-gamma release assay in haemodialysis patients after exposure to M. tuberculosis. BMC Infect Dis 2012;12:195. Sayarlioğlu H, Gül M, Eren Dağli C, Doğan E, Sahin M, Uçar MA, et al. QuantiFERON-TB Gold test for screening latent tuberculosis infection in hemodialysis patients. Tuberk Toraks 2011;59:105-10. Maden E, Bekci TT, Kesli R, Atalay H, Teke T, Solak Y, et al. 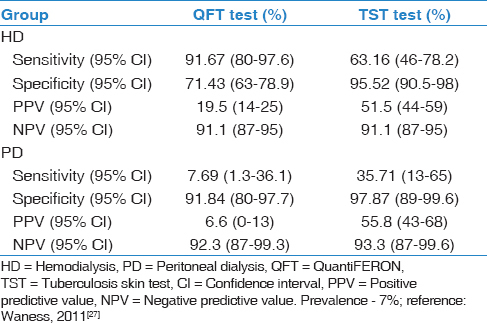 Evaluation of performance of quantiferon assay and tuberculin skin test in end stage renal disease patients receiving hemodialysis. New Microbiol 2011;34:351-6. Chung WK, Zheng ZL, Kim HS, Park JW, Lee HJ, Chang JH, et al. Serial testing of interferon-gamma-release assays for the diagnosis of latent tuberculosis in hemodialysis patients. J Infect 2010;61:144-9. Lee SS, Chou KJ, Su IJ, Chen YS, Fang HC, Huang TS, et al. High prevalence of latent tuberculosis infection in patients in end-stage renal disease on hemodialysis: Comparison of QuantiFERON-TB GOLD, ELISPOT, and tuberculin skin test. Infection 2009;37:96-102. Chung WK, Zheng ZL, Sung JY, Kim S, Lee HH, Choi SJ, et al. Validity of interferon-γ-release assays for the diagnosis of latent tuberculosis in haemodialysis patients. Clin Microbiol Infect 2010;16:960-5. Winthrop KL, Nyendak M, Calvet H, Oh P, Lo M, Swarbrick G, et al. Interferon-gamma release assays for diagnosing mycobacterium tuberculosis infection in renal dialysis patients. Clin J Am Soc Nephrol 2008;3:1357-63. Redelman-Sidi G, Sepkowitz KA. Interferon gamma release assays in the diagnosis of latent tuberculosis infection among immunocompromised adults. Am J Respir Crit Care Med 2013;188:422-31. Diel R, Loddenkemper R, Nienhaus A. Evidence-based comparison of commercial interferon-gamma release assays for detecting active TB: A meta analysis. Chest 2010;137:952-68. Metcalfe JZ, Everett CK, Steingart KR, Cattamanchi A, Huang L, Hopewell PC, et al. Interferon-γ release assays for active pulmonary tuberculosis diagnosis in adults in low- and middle-income countries: Systematic review and meta-analysis. J Infect Dis 2011;204;1120-9. Dai Y, Feng Y, Xu R, Xu W, Lu W, Wang J. Evaluation of interferon-gamma release assays for the diagnosis of tuberculosis: An updated meta-analysis. Eur J Clin Microbiol Infect Dis 2012;31:3127-37. Inoue T, Nakamura T, Katsuma A, Masumoto S, Minami E, Katagiri D, et al. The value of QuantiFERONTB-Gold in the diagnosis of tuberculosis among dialysis patients. Nephrol Dial Transplant 2009;24:2252-7. Găvriluţ A, Pop C. Predictive value of QuantiFERON-TB Gold test for the risk of active tuberculosis. HVM Bioflux 2013;5:40-3.